The Leave History Report is an employee specific report that can be found in the reports page under the 'Employee' heading. It shows leave taken and accrued for each employee over a given period of time. Other specifications include 'pay schedule' (e.g. weekly, fortnightly), and 'employee default location' which is what location the employee is set up as working from. More information about locations can be found here. The report also lets you choose one or more employees to include. To do this you simply type in their name (first or last) and select from the results. To add another one, you repeat the process. By leaving it blank you are reporting on all employees. To delete one chosen, just click the cross next to their name. The leave category option lets you choose all types of leave, or specifiy it according to the leave categories that your business has set up. For more information on leave categories, go here. The report will then list each chosen employee (or all if none were chosen), the list of available types of leave along with the opening and closing balances for the chosen period. 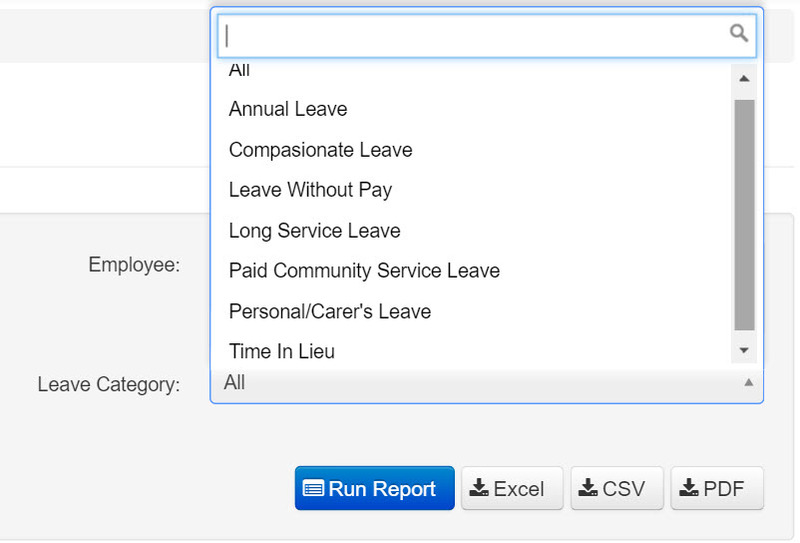 By expanding each line (clicking on the desired one, or clicking 'expand all' in the top right hand corner), the report will show the dates and amount of leave that the employee took for each type of leave.